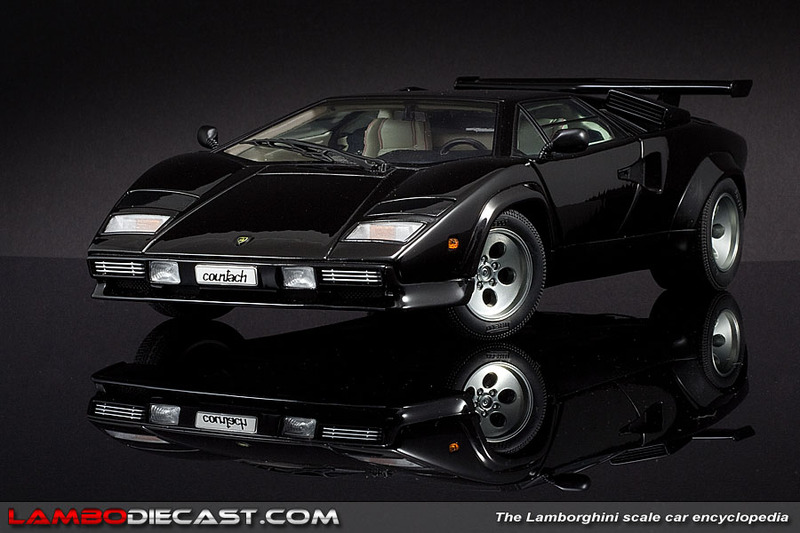 The legendary Lamborghini Countach LP500 S was the dream of every car enthusiast in my generation, I had a nice poster of a red car against the wall in my room, and I guess I wasn't the only one ... remember the side view of the red Countach with the nice lady on top ... sure she didn't heve any clothes on, but we all bought that poster for the car ... right ? 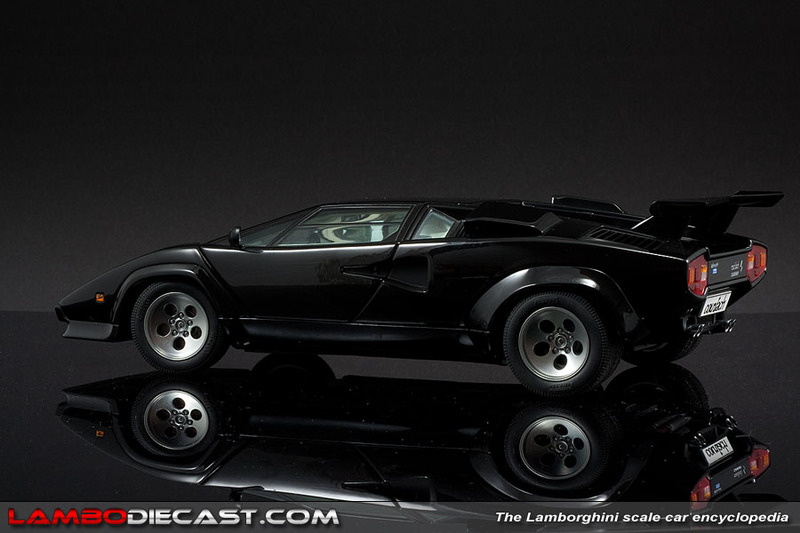 Anyway, I have several very nice Countach 1/18 scale models in my collection already, some from Bburago and Polistil, but also the more expensive, better finished Kyosho models, ranging from the green production prototype over the Walter Wolf specials, LP500 S and the smurf blue QuattroValvole version ... so I pretty much had the Countach series covered, so why shell out a lot of money on yet another Countach model, from AutoArt this time ? 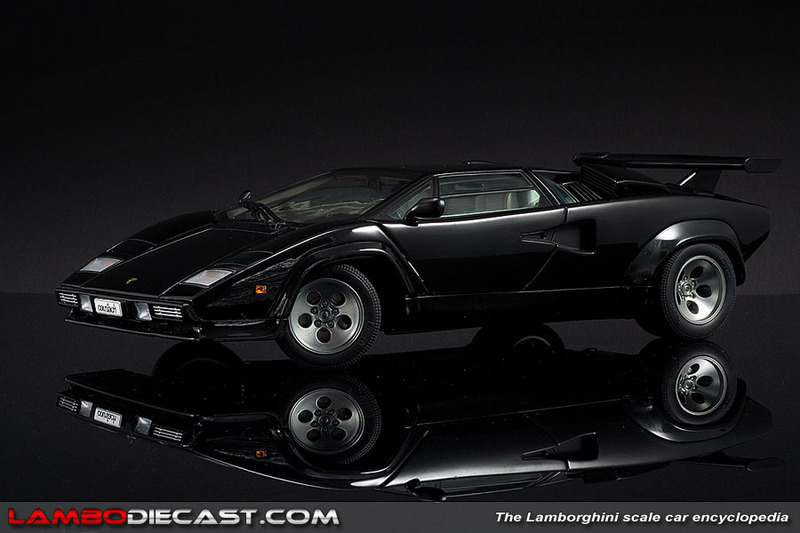 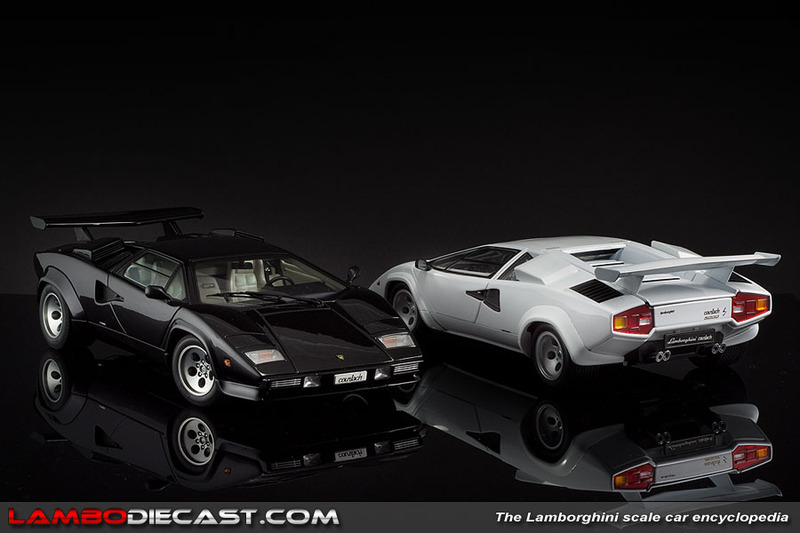 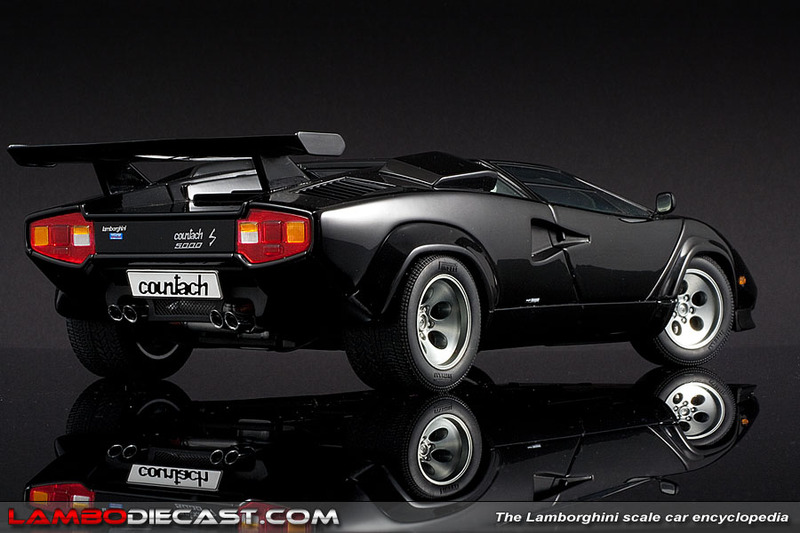 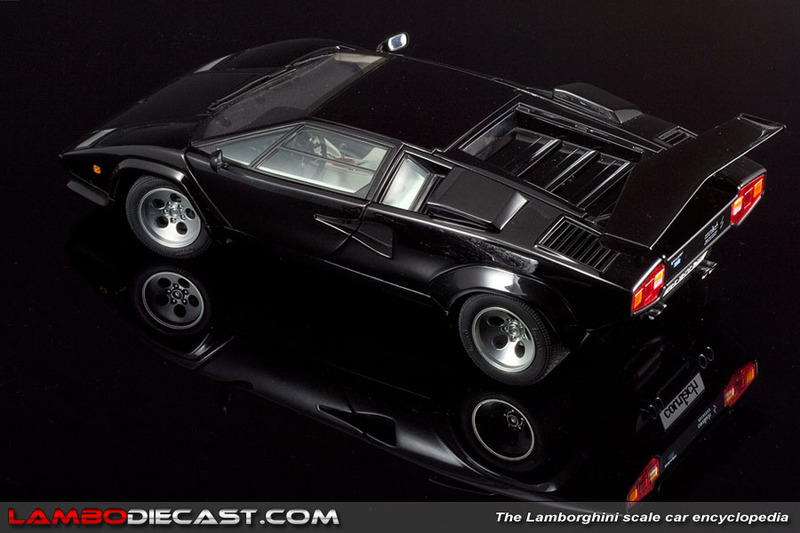 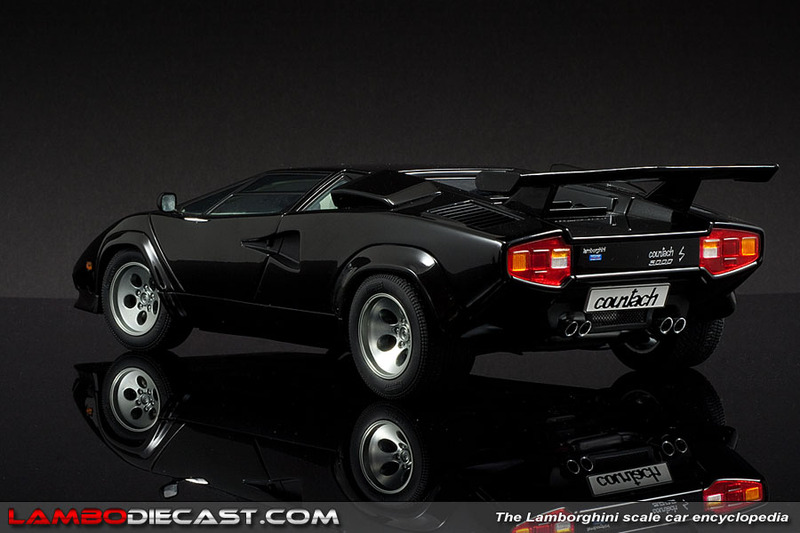 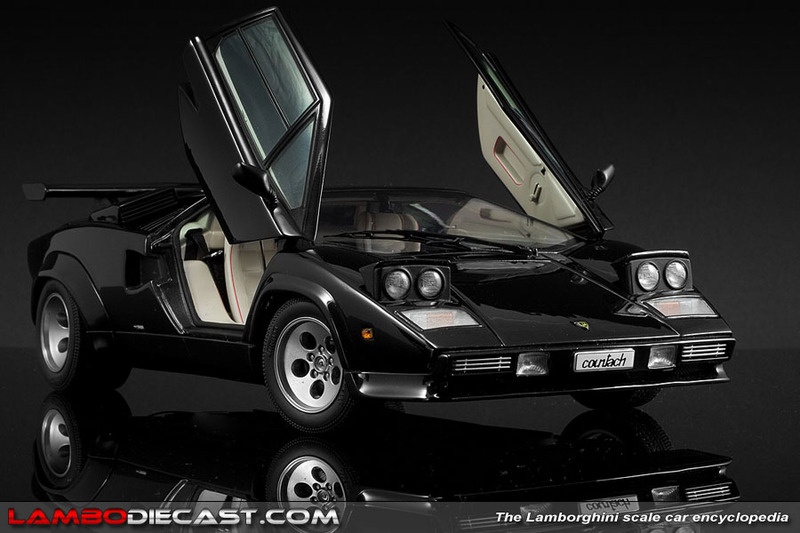 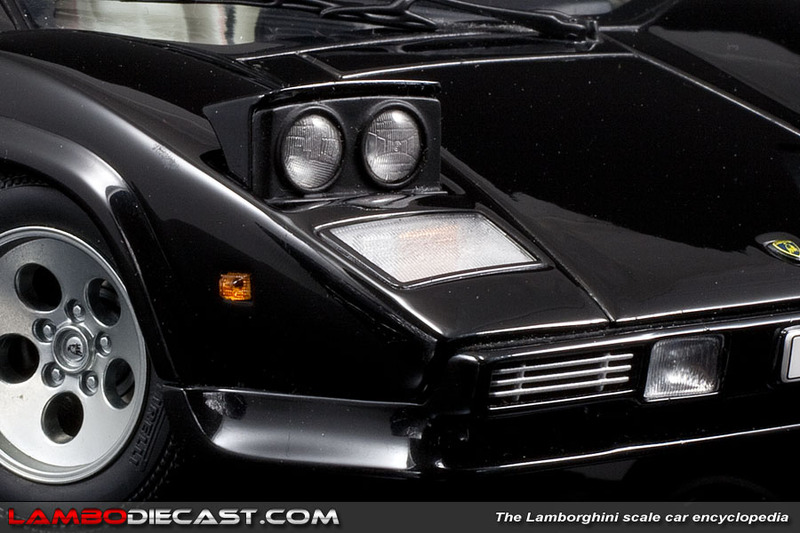 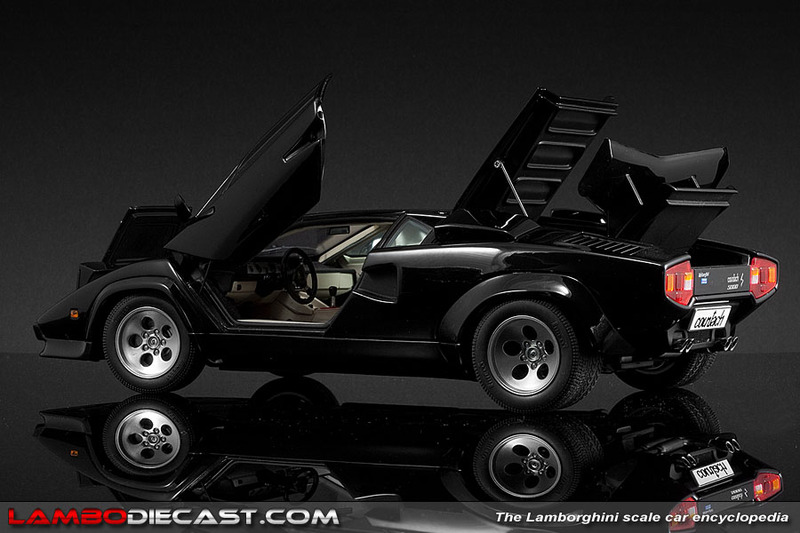 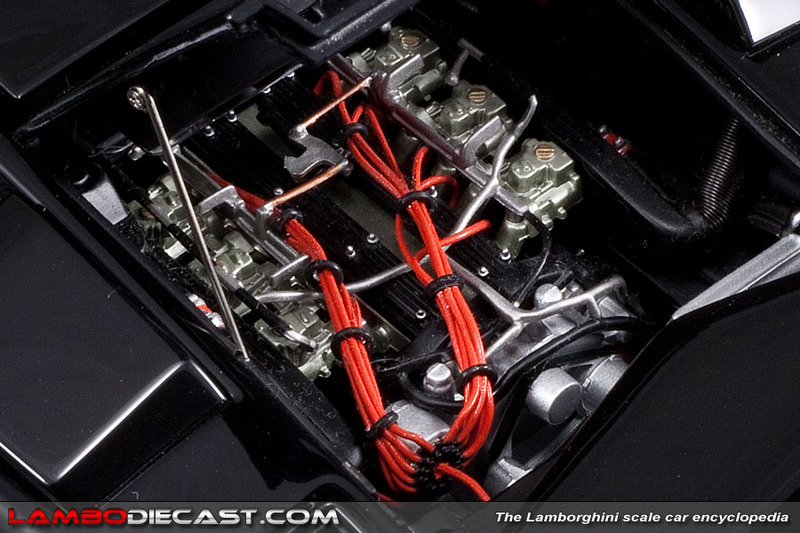 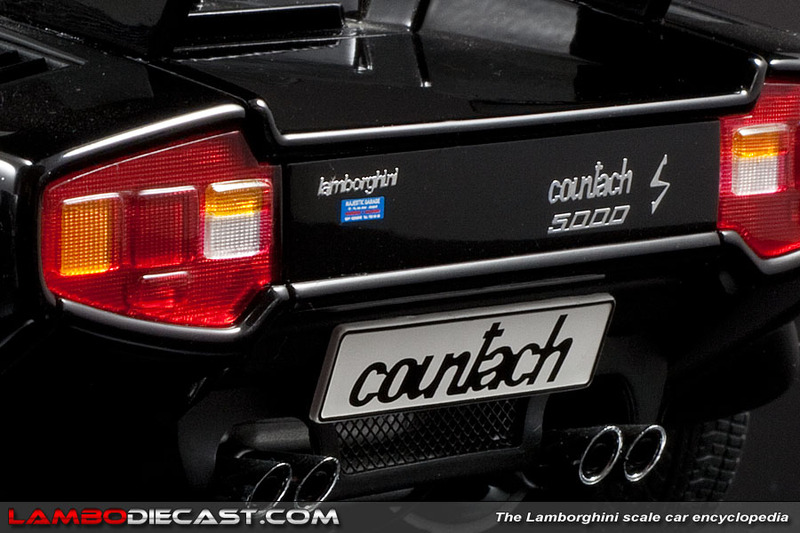 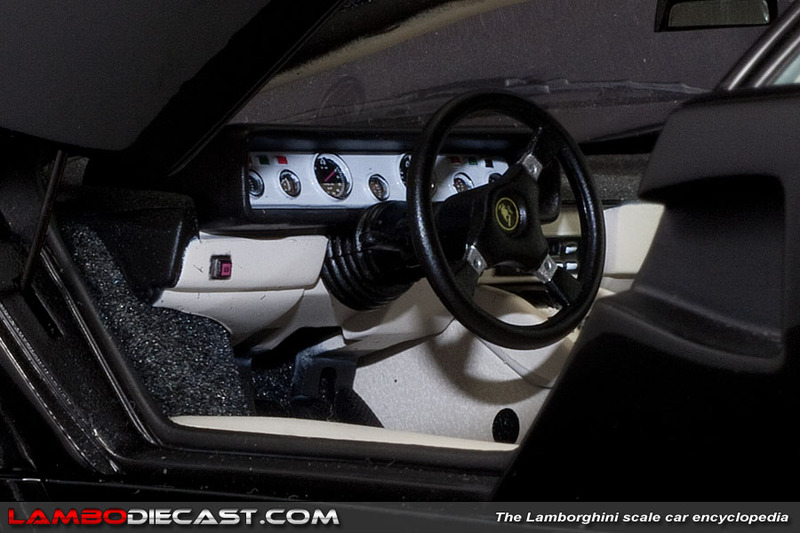 Well, simply because, for one I didn' have a black Countach yet, and secondly I didni't have an AutoArt Countach yet either, so when this one came up I put in a bid and became the new owner of this by now rather rare model car. 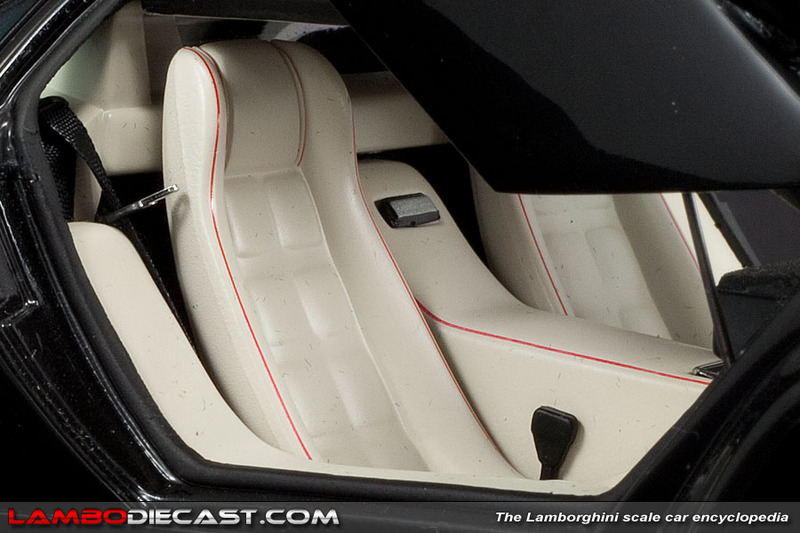 When AutoArt first introduced these Countach models they came in red, black and white, but I already own a red and a white LP500 S from Kyosho so I specifically wanted to black AutoArt version, also because this shade included the interior with white seats featuring red piping ... a stunning combination I really like to be honest. 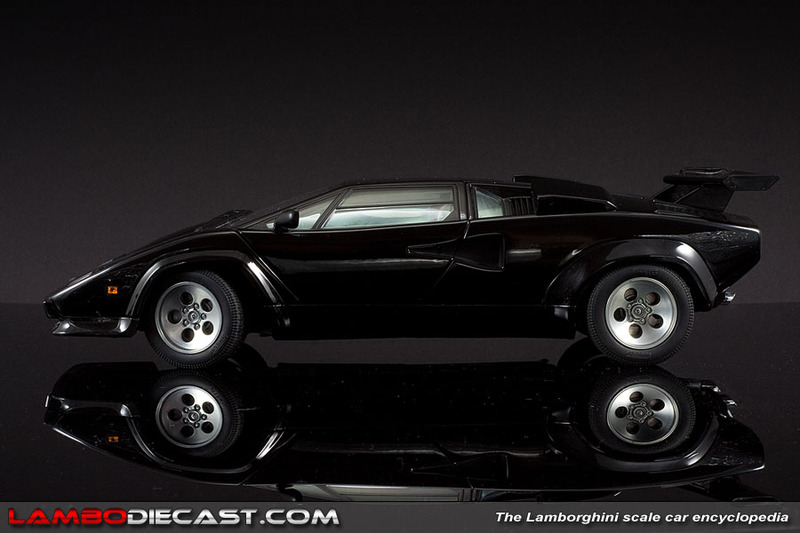 So let's take a look at the model, the wheels are very nicely done by AutoArt, not really chromed but a very high gloss silver metallic, but the real car has a slightly lighter shade without metallic flakes in it ... so this isn't really as it should be, but they are 15-inch not like those used by Bburago which are way too large on the model and most importantly ... the tires have 'Pirelli' written on them, something Kyosho didn't do. 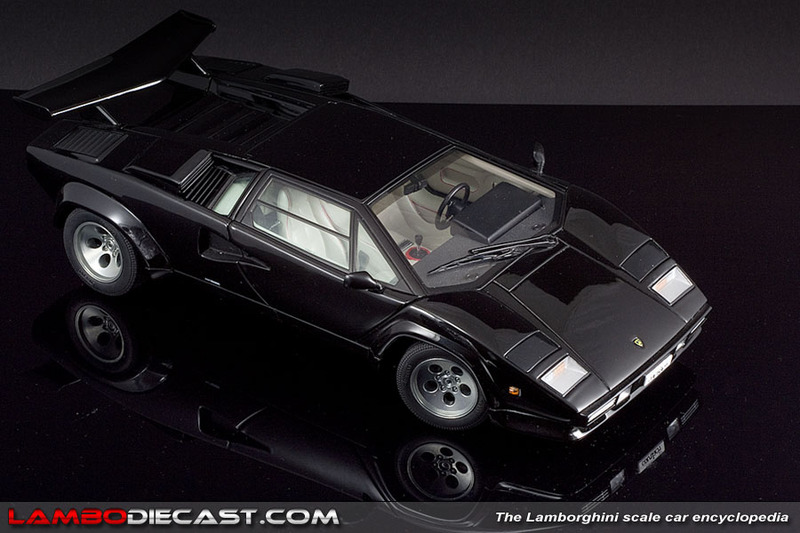 Naturally fit and detalis are both amazing on this 1/18 AutoArt model, the headlights pop up but look a bit less nice than those on the Kyosho counterpart in my opinion, but the engine bay on the AutoArt version is better, as is the interior ... but neither really stands out if you ask me, both the AutoArt and the Kyosho model on the Countach LP500 S are amazing and deserve a nice place in a Lamborghini model collection.